The versatile slicing knife is a must-have kitchen cutting instrument. This is why Peugeot is offering an exclusive range in which each high-quality slicing knife is up to the most essential tasks presented by French haute cuisine. Designed and produced entirely in Thiers, the traditional home of French luxury cutlery, and having benefitted greatly from Peugeot’s historic artisanal expertise in working with steel, the slicing knife – as aesthetically pleasing as it is practical – offers precision, strength, performance, speed and sharpness, all while also cultivating good handling, safety, comfortable use and its simple and ergonomic allure. 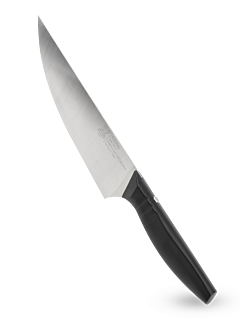 Ideal for chopping vegetables and herbs, finely slicing garlic and onion or even cutting fine slices of meat or fish, the Peugeot slicing knife is the very expression of perfect balance, in this case between strength and sharpness. Featuring a long and fine stainless steel blade, thanks to the 16% chromium content in the alloy, it guarantees unprecedented resistance to corrosion. Its handle features bold contemporary lines. The feeling in the hand, which is as comfortable as it is secure and balanced, meets the requirements of fans of exceptional knives, as well as of those with an interest in performance, precision and quality.